So what is Liquid Latex? Liquid latex is something you apply on your body and you can paint over it once it’s dry. The benefit is that when it’s dry you can just peel it off and it doesn’t stain your skin. People use this product on special effects make up but it has taken more popularity recently by nail artists to help them clean up around their nails easier and not use that much acetone which dries your skin. Do I need the really expensive kind? Do I need a special brush or bottle for it? No. You can buy a jar from Amazon (link here) and you can fill out an empty bottle of nail polish and use that, which is what I use. No. All liquid latex products work the same regardless of the color. 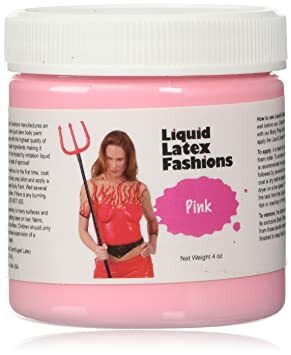 I use the Ammonia Free Liquid Latex Body Paint – 4oz Fluorescent Pink from Amazon. It was around $7 when I bought it and have used it so many times and still have more than half the bottle.